Great Britain, it seems, is a treasure chest filled with old and new gems, and some that are dying to be discovered. Even recently, the UK has decided to astonish us once more when an entire city was discovered near Stonehenge in England by researchers on the Stonehenge Hidden Landscapes Project. Uncovering monuments of religious significance, gravesites, and remnants indicating a liquor-thirsty society, the conclusions that were made were the ancient city’s residents were boozers who in a drunken state would perform gruesome rituals on the dead. Charming. But not all of Great Britain's greatest discoveries were so macabre, and likewise not all of them were found so deliberately. Oftentimes, the greatest discoveries in British archaeology were found almost by accident. It’s not every day someone finds an archeological treasure from the Roman Empire in her backyard, but when Mrs. Edith Pretty suspected a mound looked too weird to be an ordinary hill, what was discovered was a portal to the Anglo-Saxon civilization. In fact, a 27 meter-long Sutton Hoo Burial Ship, as it's now called, remained undisturbed yet full of promise when archeologists explored the historic artifact. Along with the ship intricately decked out with rich materials, gold jewelry, silverware, an iron helmet and garments were confiscated, which can be seen at the British Museum. By the body that was also found interred in the soil proved that the Sutton Hoo Burial Ship may have been venturing on a royal quest. When a couple from Northumberland realized that their flower planter was actually an ancient roman coffin not only were they dumbfounded, but they unknowingly stumbled onto a goldmine. The casket, which is worth an estimated £100,000 (about $150,000), is a masterpiece of Carrara marble engraved with images of the Three Graces depicting ancient Greek Mythology. Its elaborate features indicate that the coffin once contained the corpse of an affluent woman during the early 2nd Century A.D. How the coffin managed to become a garden piece for decades, the world may never know. But it might just be the most revered sarcophaguses of Roman funerary art to provide a glimpse into the past. We may never know who actually wore this century-old ceremonial garment, but its exquisite craftsmanship does pique interest. Long before the Mold Cape became a must-see attraction of the British Museum it represented the prestige and power that enveloped the Bronze Age Britain. And thanks to the workmen that discovered their body while mining for stone in a gravel pit in 1833, we have a direct link to this powerful society. The Mold Cape vibrantly flaunts a gold décor with three zones lined with patterns and ridges. The cape is believed to have been made for a child or perhaps a woman of great wealth. “Long live the king” is a statement that comes to mind when the body of Richard III of England. The king, who died in the bloody Battle of Bosworth during the War of Roses, was laid to rest in Leicester in 1485. The infamous ruler who has been a dominant figure throughout history, whether in the pages of books or on screen, was made out to be a scoundrel rather than a hero. This might explain why his bones were excavated from beneath a car park in 2012 in an area that was once belonged to the Greyfriars Friary. Upon finding his corpse, signs confirming this unlikely burial spot as his location included injuries he faced during battle including a hit to the spine and wounds on his skull. The Romans sure loved their jewelry and money, which is probably why people have been stumbling upon their loot for years. The discovery of a Hoxne Hoard proves it is always good to have a sidekick who knows his way around a metal detector. In search for his hammer, a farmer named Peter Whatling recruited his friend, Eric Lawes to help him find it with his trusty metal detector. In no time the beeping sound of the machine caused Lawes to dig through the English field removing gold coins, jewelry as well as silver spoons and coins. Archeologists were later summoned to the village of Hoxne where they excavated a chest that contained other remains including cooking utensils and the famous silver “Hoxne Tigress.” With more than 14,000 coins extracted from the site, The Hoxne Hoard is notably the largest collection of currency from the Roman Empire between the 4th and 5th centuries and a must-see exhibition in the British Museum. One assumes Whatling was able to purchase a new hammer after the find. The Vale of York Hoard also took its discoverers by surprise. Enjoying their new pastime of metal detecting, a businessman by the name of David Whelan and his son accidently came across the hoard which was buried some 30 cm underground. Approximately 615 silver coins were excavated as well as dozens of other treasures that are now housed in the Medieval Gallery of the Yorkshire Museum in York. 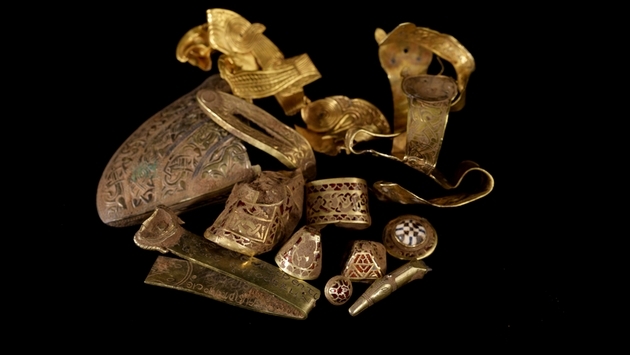 The Staffordshire Hoard was also an amazing find that quickly became the largest to contain Anglo-Saxon metalwork. Again, it was an intrepid (or possibly bored) explorer armed with a metal detector in an otherwise unremarkable field who made the discovery. Whether it remained locked in the soil to keep out of enemy reach or a long forgotten treasure, its mystery lies in the detail of the exquisite gold and silver patterns decorating the jewelry, coins, weapons and other ancient items. Also located in a field in England, the Staffordshire not only sparks attention in the Birmingham Museum & Art Gallery and the Potteries Art Museum & Gallery, but may even be traced to one of England’s most powerful kingdoms.